Summers for the Southern kitchen means one thing: vegetables, and lots of them! Your garden always seems to produce more corn than you know what to do with. I love corn! But as the summer wears on you struggle to come up with ideas of what to do with it all. 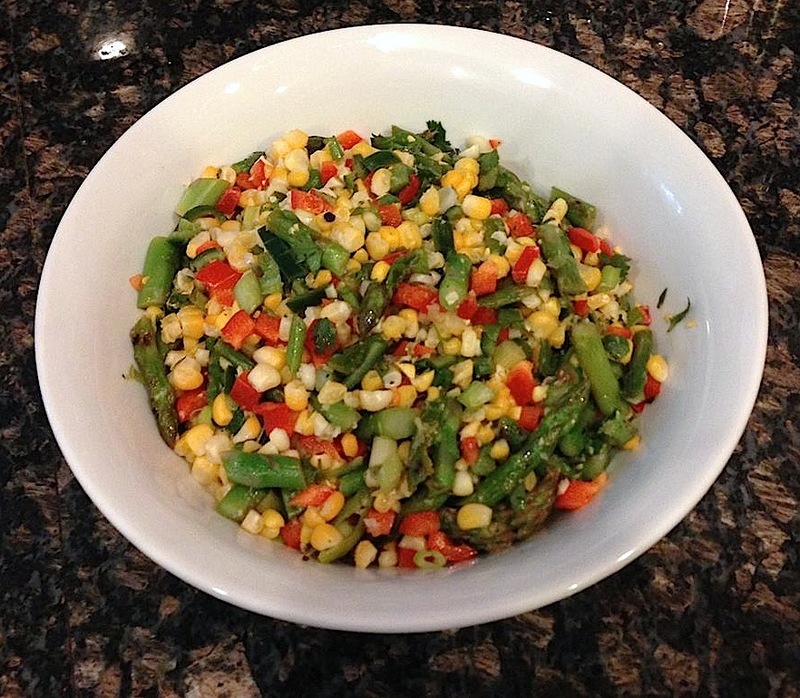 A few years ago I came up with a Corn and Asparagus Salad that was a hit. I have two variations on the same base, Southwestern and Italian. The variation of spices and heat give it enough separation to make it feel fresh. You need to cook the corn and the asparagus. You have as many options as you can think up. I like mine roasted on the grill for a few minutes, but you can also boil, blanch, or roast them in the oven. You will want to cook the asparagus until it is still a little crisp. Once you add the dressing, the vinegar will continue to break down the veggies, so I caution you to not over cook them. Once cooked, you will remove the corn from the cob and slice the asparagus in ½ to 1 inch pieces. You will also need to dice the red pepper and scallions into small pieces. I prefer a small dice, but too small a dice can make it feel more like a salsa. Place the above ingredients in a mixing bowl and whisk together. You will need fresh Basil. You may also want to roast your red pepper. If you like roasted red pepper, it definitely gives the salad a more Italian flair. If however you don’t have the time, energy, etc. using the fresh red pepper will give you a satisfactory result. Fresh Black Pepper to taste. Place all of your cut vegetables in a bowl and add your dressing. Mix gently. Set aside, until ready to serve. This dish is excellent the next day, so it is perfect for picnics and those family reunions everyone is headed to this time of year. Looks like you are off to a great start.